Watteau had many devout followers and critics during his career and after his death. Despite his reputation dwindling with the fall of Rococo, after the French Revolution it grew once again. Watteau's acceptance into the prestigious Academie de Peinture is proof enough of the impression the artist made on his critics. 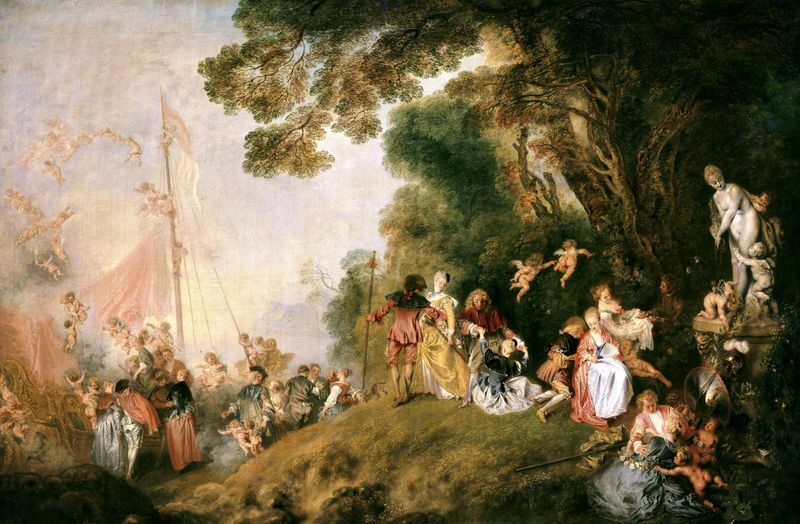 In his reception piece, Embarkation for Cythera, Watteau paints the Greek isle of love, with characters of the Italian comedy enjoying the beautiful scenery they were graciously painted in. 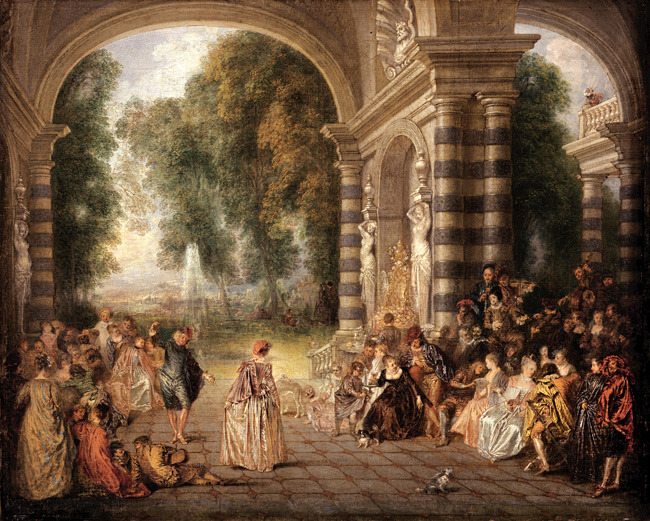 Since his work did not fit in any previously created categories, the judges of the Academy accepted Watteau under a category of his own, "fete gallantes" or grand themes. The judges were impressed with the sweetness of Watteau's palette, which paid homage to the colorism of sixteenth-century Venetian, and they also admired his aesthetic of Rococo décor. His brush techniques created a mood and ambience rather than reflecting reality. "If painting consists, not in the expression of tragedies upon a canvas, but in inventing with poetic feeling, an impressing by color, Watteau is the greatest of French painters. None has surpassed him in his love of nature and his feeling for the ideal. " (th. De Banville). 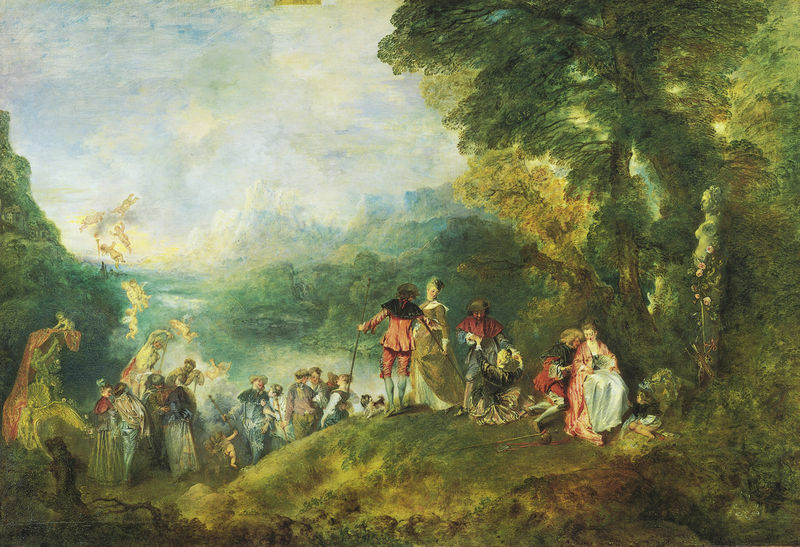 Critics praise Watteau for his treatment of light, noting how the "champions of light and color" in France come from the north of Europe. Some even go as far as saying that anyone who notices Watteau for his subject matter is clearly missing the real talent of this artist. 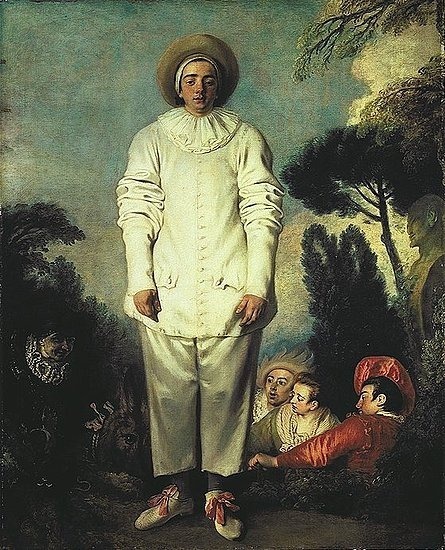 Critics are impressed with all aspects of Watteau's paintings and credit him with bringing back laughter and liberty with his "fetes galantes"
"There are apes dancing, riding, swinging, carrying flags, painting, playing music, bathing, and dressing, but nothing is caricatured. Watteau has only sought effect in graceful, piquant, and ingenuously-chosen posing... But we must not attach too much importance to this work; in the richness of its detail we can appreciate the fertility of the artist's imagination, but it was impossible for him to give scope to his best qualities in these isolated figures detached upon a white ground; all effects of chiaroscuro and light were absolutely interdicted." 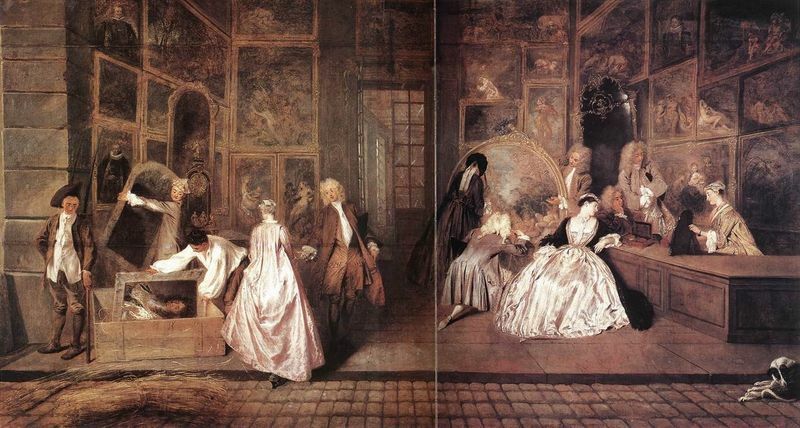 Other critics have challenged Watteau's stylistic ability accusing him of being "deficient in the art of composition. " They agree with Pompadour that he had more to learn regarding his figures, as in his larger works, groups are often painted in rows. It is only in his smaller works that the figures are in the same plane. Critics also note that Watteau did not see in flowing curves but in tight, straight lines when it came to form. The substructure of even his quick sketches is severe. Rectilinear severity in L'Enseigne de Gersaint is displayed with the standing lady and the kneeling connoisseur. 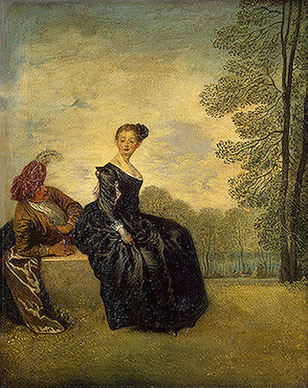 Watteau's reputation declined with the rise of neoclassicism in French art, but after the French Revolution, and especially in the Romantic period, it grew again. As the inspiration for New York-based Jed Perl's newest book, Antoine's Alphabet: Watteau and His world (2008), Watteau is still sparking the interest of modern day critics. The prologue reveals Watteau is Perl's "favorite painter", so one can imagine he reflects positively in the short texts centered on Watteau's painting and drawings. Perl investigates the bohemian artist and his tangled relationship between art and life through historical facts and his own personal reflections. He even brings Watteau right into the 20th century; Perl sees Watteau as giving new insights to modern personas like Katherine Hepburn. He credits him as an artist who continues to deepen our understanding of the place that love, friendship, and pleasure have in our daily lives.